When I first began to study Thai Massage in the late 1990s, I had a magical experience which is still as clear in my mind as if it had been yesterday. I was a student at Chiang Mai’s Old Medicine Hospital, the original and first Thai Massage school in the north of Thailand. At that time I had been studying and practicing for a few weeks, but I had never done any real massage work on clients. 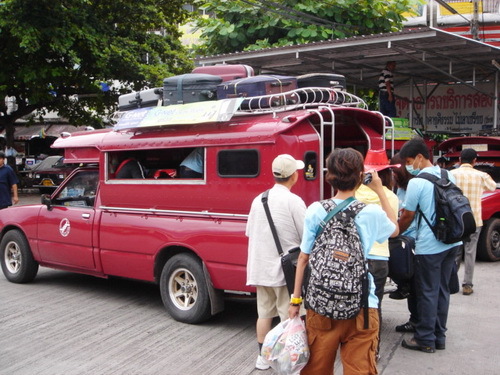 One day the school announced an excursion to a village near Chiang Mai. All teachers, teaching assistants and students were encouraged to come along. The purpose of the trip was to provide free treatments to anyone in the village for an entire day. Old Medicine Hospital consists of three sections: A Thai Massage school, an herbal medicine school, and a massage shop with many therapists on staff. It is quite a large operation with several teachers and assistants, and throughout the year there are always dozens of students around. So on that particular weekend we took off in a caravan of truck taxis. When we arrived at the village, we set up shop in the local temple. The herbal doctors provided consultations and the rest of us gave Thai Massage treatments. I had been both excited and apprehensive about this event. Although I had been studying for a while, I was still a rookie with no experience of actually working on people with real problems. So I was wondering what I could possibly contribute. But the school officials told me not to worry and just come along. So I did. You have to imagine the situation in the temple. This was not a professional private massage room with a comfortable mat, soothing music, and a well-to-do client who treated him or herself to a 1hr/$70 massage for a stiff neck from watching too much TV or browsing the internet for too long. There were only hard cement floors with thin straw mats and no pillows. And privacy was the last thing on anyone’s mind. All day long lines of villagers came through the temple, many with serious issues, diseases, deformities, pain, and other traumas. A lot of them were farmers with thick callouses on hands and feet. 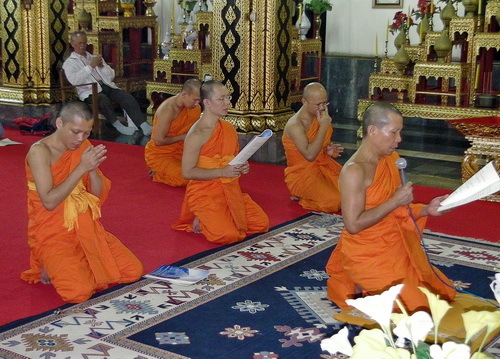 They were either assigned to the herbalists or to the Thai Massage therapists. We were given 20 minutes for our sessions in order to get through the multitude of people who were seeking help. The straw mats were lined up so closely that you had to be careful not to bump into the therapist and client next to you. I did not speak any Thai in those days, and the villagers did not speak one word of English, so our only communication was through a translator, or sign language and smiles. It was a very humbling experience. Here I was, a rookie Thai Massage student with no real therapeutic experience, and suddenly I was confronted with all those people, many of whom had issues that could certainly not be fixed with a 20 minute massage session. I felt nervous and overwhelmed and doubtful as to my effectiveness. But what happened was quite amazing and something that I had not expected at all. When I worked on those people I noticed that they had a simple faith in the treatments and gratitude for the free sessions. Even though I knew I could not have accomplished much physically in my 20 allotted minutes, my clients were very appreciative and many told me they felt better now. 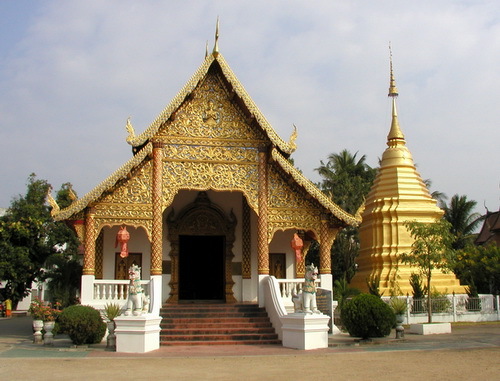 Imagine the atmosphere: A beautiful and tranquil temple filled with dozens of healers, herbalists, and Thai Massage therapists. Monks chanting, temple gongs sounding, and Buddhist mantra music playing. Hundreds of people from the village and surrounding areas were streaming through the temple all day long. There was a healing energy present and the villagers had the expectation that something good was about to happen to them. I realized that the energy of the place and the expectations of the clients were probably more important than my actual therapeutic skills, and so I surrendered to just doing my sessions without worrying about my lack of experience. I learned a lot that day. It was a dramatic demonstration that Thai Massage therapy or any healing art is not just a matter of technique or skill. The overall energy of the environment, the sincerity and intention of the therapist, and the expectation of the client play a major role in the healing process. At the end of the day I was exhausted and exhilarated. My feet and knees were hurting from working on the hard floor. But for the first time I had seen healing at a profound and very real level. I had seen the bigger picture and never again would I think that Thai Massage is just a technical skill. That day marked my transition from a massage practitioner to a healing arts therapist. The author, Shama Kern, is the founder and director of Thai Healing Massage Academy. He has been practicing and teaching Thai Massage for 18 years, and he is the author of 20 online Thai Massage training courses. Thank you Ariana for your kind words. Your support of my writing is a real source of inspiration for me! Thank you so much for sharing with us your passion to Thai massage! For a couple months now I receive your e-mails and enjoy every one of them.This article “Thai massage Healing Practice” deeply touched me. Thanks Larissa, it was an experience which I will never forget for sure! I am glad that you enjoy reading my messages. I always try to provide interesting and useful content. Wow! this kind of brought a lump to my throat-I dream of visiting Thailand… It also reminds me of what I tell my Yoga teacher trainees if they moan about facilities or noise in the venues we train in-I say go train in India-you can then learn on a scorching hot terrace with monkeys,cars, horns, elephants and a whole other lot of noise screeching in the background-you soon learn to go into yourself and not notice those things! I feel honoured to have met such an inspiring Yogi as yourself Shama-a true yogi-you are so the ball with your students all the time, giving us interesting bits of information and new things to look at all the time. You really do spoil us. I do like your analogy about training in India. It reminds me of one well known Thai Massage school near Chiang Mai which was in a village and had only the most basic facilities with pigs running around everywhere. But countless students went there to study. It is interesting to see how expectations change depending on where you are. If you would offer training under such circumstances in the western world, nobody would come. But here in Thailand people found this school to be an exotic adventure. Thank you for this wonderful article!!! I also had a dream to study thai massage and to become a practitioner.I finished 3 courses at Wat Po Massage school.I hope people will understand all your feelings and impressions from becoming a thai massage master.Thai massage is just not working with your hands or knees.Its working with your soul,mind,intention…Impossible to describe the work of the practitioner – everyone needs to feel it. Eugene, I think there are some elements of Thai Massage which are best felt or experienced in Thailand. Luckily both you and I had the opportunity to do that. I hope I can convey these elements in my articles to those who cannot come here to experience it. 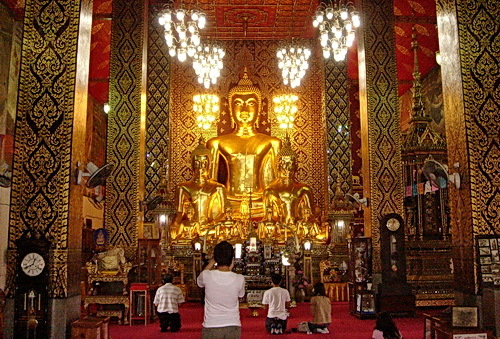 The temple excursion is one of those examples – such things generally don’t happen in the western world, but they are such an important part of the soul of Thai Massage. Nice article, very nice article. Hi Livia, I know the feeling of making blind choices and being disappointed with a session. I generally only get massage from therapists whom I know. However I live in Chiang Mai and am not familiar with the Bangkok scene. For Chiang Mai I could have given you a recommendation, but I am afraid I cannot help you for Bangkok. I don’t think there is a website which lists good therapists. The massage scene is always in flux, therapists move around and come and go. It would be a better bet to find one massage establishment where they are serious about only hiring good therapists or where someone trains them well. In other words a place with a high standard. This so true when you are saying that our quality of touch, our intention, our focus, and our breathing are more important than knowing a sequence of techniques. That’s what makes the difference between what I call a “massage mechanic” and a healer. When the magic happens, then we know why we are in the healing arts profession. Not many professions can claim that the “magic happens”, but we can! 🙂 It’s a good feeling and we know that we are doing a little something to make this planet a better place. Hi Shama! Wonderful article-deeply conveys the basis of healing-presence and open-hearted lovingkindness. When a session is given with that intention,everyone receives.Technique is wonderful to learn but,if your heart isn’t present,is it really therapeutic or just ‘doing the moves’? And to comment further: Shama not only thoroughly covers technique,but conveys the heart and energy of a healer in his video courses. Thank you Heidi, I really appreciate your kind words! Thank you for sharing this experience .I am so inspired by the work you do.I wsh to become the best healing art therapist I can be for those who need this art work.Having faith that a healing or level of wellbeing will take place makes all the difference. Thanks Kathy. I hope that I will be able to contribute something to your becoming the best healing arts therapist you can be. This is what makes my work so worth it for me! I have just taught a Thai Foot Massage course in a college – some of the students believed that the course was too short to teach them more than ‘what is involved’, and told me they would never dare do the treatment ‘for real’. I told them that they were already doing them ‘for real’ if they were doing them with a focused mind and the intention of helping the person they were massaging. I have shared this article to my page for all the students to read! I hope they hear and understand the message. I hope so too Sarah, and thanks for sharing it. By the way, I am getting a Thai Foot Massage once a week and I love it. Reading your posts is like devouring letters from a favorite family member who masters the art of storytelling and warmly, transparently shares his life with everyone. I received inspiration to surrender my nervousness and doubt and practice simple faith, doing sessions without worry. That’s going to be my focus this coming week. Thank you for sharing even the scary chaotic memories of your professional life. I would like to know more about you—-like how did you land in Thailand to begin with??? Sara C., I love your account of students being hesitant to massage “for real”!!! In the middle of the night when a person has pain or ones child/mate/grandparent is in pain, things get “real” really, really fast. One of my favorite quotes from Theodore Roosevelt is “Do what you can with what you have, where you are”. Amazing article! As usual you describe every detail! Thanks! Thank you Vasya, I appreciate your input! Such a great story, Shama! You managed to get across the essence of what Thai Massage Therapy is really all about. If you don’t mind, I think I’ll work your article (as is, and with all due credit, links etc.) into some of my live training classes.